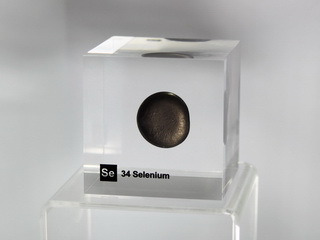 Selenium was discovered in 1817 by J.J. Berzelius in Stockholm, Sweden. Selenium exists in several allotropic forms; red selenium is monoclinic and contains Se8 rings. It has a melting point of 180C and a relative density of 4.45. 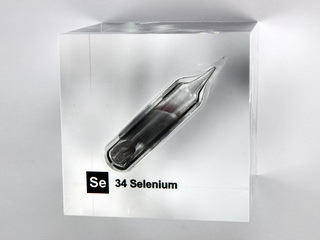 The grey (metallic) form of selenium is formed when other varieties are heated to 200C; this has a melting point of 220C and a relative density of 4.80. Selenium is widely distributed, mainly as the selenides of heavy metals, but only has an abundance of 0.05 ppm in the earth's crust. The metal burns in air and is unaffected by water. It is soluble in alkalis and concentrated nitric acid. The electrical properties of selenium are of particular interest as it is both photovoltaic (i.e. 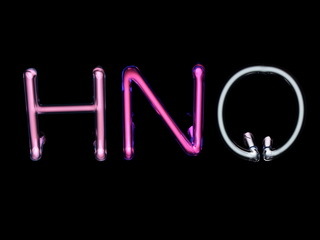 it becomes an electrical conductor when exposed to light or ultra violet radiation) and photoconductive (i.e. the electrical conductivity increases with increasing illumination). These properties mean that selenium has applications in the electronics industry (e.g. 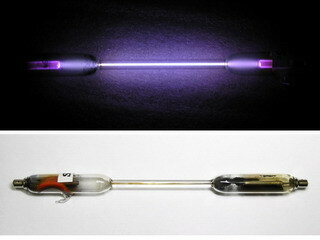 in the manufacture of photoelectric cells and solar cells). 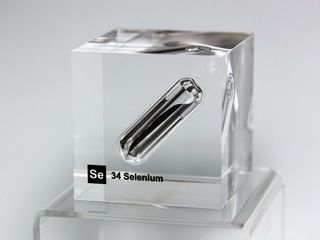 Selenium is used in the ceramics and glass industries (in the latter the element being used as a decoloriser and also in the manufacture of red glasses and enamels). 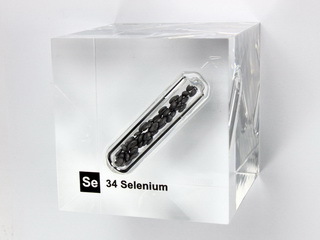 Selenium is an important trace element for humans, the average body containing approximately 14 mg.